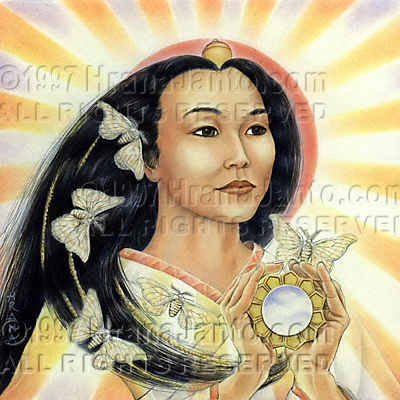 Of all the religions currently practiced by significant numbers of people, the only one whose chief divinity is female is Japanese Shinto, based on the worship of the sun goddess Amaterasu ("great shining heaven"). In her simple shrines-notable for their architectural purity and unpretentiousness and for the central mirror that represents the goddess-Amaterasu is honored as the ruler of all deities, as the guardian of Japan's people, and as the symbol of Japanese cultural unity. Her emblem, the rising sun, still flies on Japan's flag. Even the inroads of patriarchal Buddhism have not destroyed the worship of the bejeweled ancestor of all humanity. There is one central myth of Amaterasu. She quarreled with the storm god Susano-o and brought winter to the world. Two reasons are given for her annoyance with him: one, because of his murder of Amaterasu's sister, the food-giving goddess Uke-Mochi; the other, because of his deliberately provocative acts against Amaterasu herself. The latter version has it that Amaterasu did not trust her brother Susano-o because of his excesses and his constant shouting. One day he came to heaven to see her, claiming that he meant no harm. She was wary, but he promised that he would undergo a ritual test to prove his goodwill. He said he would give birth, and that if his intentions were peaceful, the children would all be boys. Amaterasu grabbed Susano-o's sword and broke it with her teeth, spitting out three pieces which, striking the ground, became goddesses. Susano-o asked Amaterasu for some of her jewels: she gave him five; he cracked them open and made them into gods. But then Susano-o grew wild with excitement at his creative feat and tore through the world destroying everything in his path: he even piled feces under Amaterasu's throne. As though that were not enough, he stole into her quarters and threw a flayed horse's corpse through the roof of her weaving room, so startling one of Amaterasu's companions that she pricked herself and died. This was too much for the sun goddess. She left this mad world and shut herself up in a comfortable cave. Without the sun, the entire world was blanketed with unending blackness. The eight million gods and goddesses, desperate for their queen's light, gathered to call out pleas that she return. But in her cave the goddess stayed. The shaman Uzume, goddess of merriment, finally took matters into her hands. She turned over a washtub, climbed on top, and began dancing and singing and screaming bawdy remarks. Soon the dance became a striptease. When she had shed all her clothes, Uzume began dancing so wildly and obscenely that the eight million gods and goddesses started to shout with delight. Inside her cave, Amaterasu heard the noise. As it grew to a commotion, she called to ask what was going on. Someone paused to answer that they had found a better goddess than the sun. Provoked-and curious-Amaterasu opened the door of her cave just a crack. The gods and goddesses had, with great foresight, installed a mirror directly outside of the cave. Amaterasu, who had never seen her own beauty before, was dazzled. While she stood there dazed, the other divinities grabbed the door and pulled it open. Thus the sun returned to warm the winter-weary earth. Mounted again on her heavenly throne, Amaterasu punished Susano-o by having his fingernails and toenails pulled out and by throwing him out of her heaven.